Early in the first issue of Marvel Comics’ “Haunted Mansion,” a new one-off, five-issue series inspired by the Disneyland staple, readers encounter a ghost. This is expected. After all, as Haunted Mansion lore tells us, there are 999 of them living inside the manor. Only this ghost isn’t of the grim, grinning sort, as described in the attraction’s popular song. This ghost is all bones and menace, with a foreboding cape and a sword flailing wildly. It’s the Haunted Mansion Disney aficionados know and love, only slightly more dangerous. “It makes sense for a comic that we can go a little more sinister here and there,” says Tom Morris executive creative director of Walt Disney Imagineering, the arm inside the Disney company responsible for theme park attractions and experiences. Since it opened its doors in 1969, the Haunted Mansion has specialized in mystery. It’s a collection of endless corridors and twisting rooms that are seemingly disconnected. What do hitchhiking ghosts have to do with the jolly ghouls who are seen frolicking in a ballroom? What about the bride in the attic? Does she have any connection to the spirit who appears in a crystal ball? And just who is the Hatbox Ghost? All that says nothing of the gruesome tale once conjured for the mansion’s backstory, one involving a sinister sea captain who murdered his wife and buried her in a brick wall. Some of these stories have been lost to history. Today, for instance, there are only brief nods to the fearsome ship commander. But the entirety of the Haunted Mansion’s history was fair game for Marvel’s comic. There was, however, one rule: Keep the past vague. Marvel’s “Haunted Mansion” is ultimately the story of a teenage boy who ventures inside the spooky house after discovering that the spirit of a loved one may be trapped somewhere within its walls. The boy, Danny, is something of “scaredy-cat,” says Williamson, and in the first issue, he encounters what millions of Disneyland guests have already seen -- paintings that stretch, windowless and doorless rooms and floating musical instruments. He also comes face-to-face with some ghouls that Disneyland regulars may have overlooked. The aforementioned sword-wielding skeleton figure, for instance, is indeed featured in the attraction, but only glimpsed briefly in a painting. 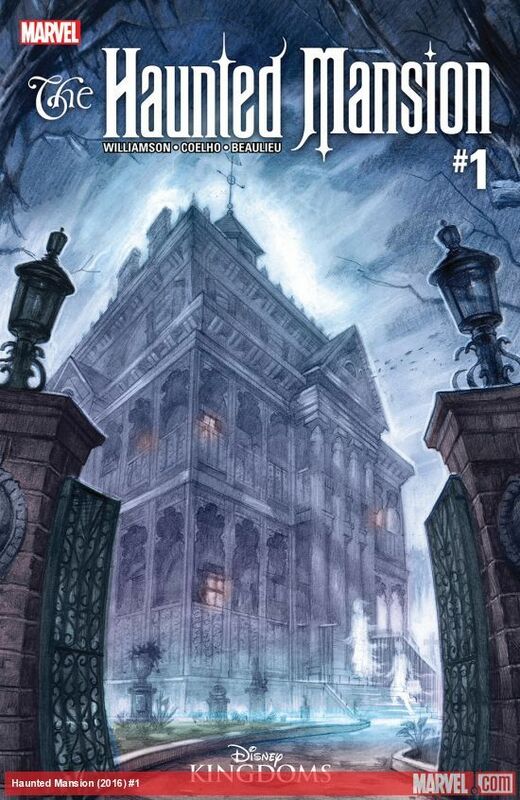 Instead of, say, assigning a narrative to known figures, the comic allowed Williamson and Imagineers to explore lesser-known dwellers of the mansion. Numerous theories about the mansion’s backstory have been bandied about over the years. The ride’s beginnings date to the early-to-mid-1950s, first gaining traction when Walt Disney assigned the project that ultimately would reside in the New Orleans Square section of Disneyland to Ken Anderson, an animator turned Imagineer. Anderson’s treatments give the ride a much more disturbing core than its current incarnation. A Disney Editions book, “The Haunted Mansion: Imagineering a Disney Classic,” details Anderson‘s initial drafts. They all present a morbid twist for the family attraction. There was a sea captain -- Capt. Bartholomew Gore, to cite one of his early names -- who was actually a notorious pirate. His young wife, on discovering this news, was murdered -- bricked into a wall in one version of the story, thrown down a well in another. The comic in its opening pages makes allusions to the many Haunted Mansion theories. One mentions the pirate captain. Another implies that the house belongs to the bride in the attic. Constance is her name, and she’s known as the “black widow” bride because of her penchant for killing her husbands. Unlike, say, the poorly received 2003 film “The Haunted Mansion” starring Eddie Murphy, Williamson and the Imagineers did not want the comic to read as the end-all, be-all for the mansion. Whatever theories may exist, the comic plays with them rather than trying to set them straight. One character, however, has clearly fascinated Williamson, and that’s the bride in the attic. Though her face isn’t seen in the first issue, her chilling presence hovers over the story. 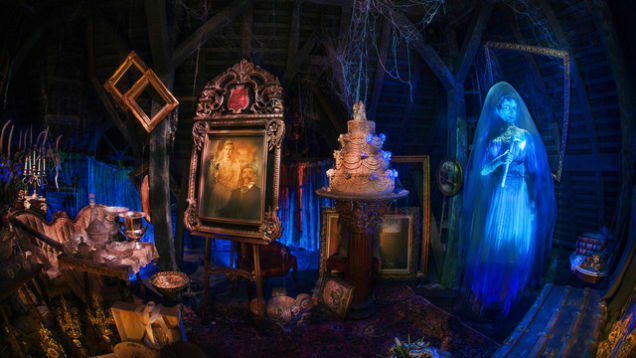 In the Disneyland attraction, the attic that houses Constance is one of the few places in the ride with a clearly defined story. Now, an ax-wielding ghost, she’s seen as a bride in numerous photos, the pearls around her neck getting more extravagant with each groom. “She’s a murderer, right?” Williamson says. Constance, Williamson says, is the scariest ghost in the attraction. And though Disneyland’s Haunted Mansion may rely more on humor than frights, Williamson says it still can teach one about managing fear.